I’ve implemented shadow mapping on the MD2 Library using the Vortex Engine for iOS wrapper. Shadow mapping is a technique originally proposed in a paper called “Casting Curved Shadows on Curved Surfaces” , and it brought a whole new approach to implementing realtime shadows in 3D Apps. Shadow mapping on iPad. The shadow is calculated in realtime and animates as the model moves. 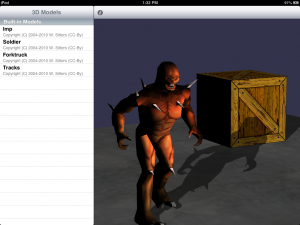 Implementing shadow mapping on iOS is by nature a problem that spans several programming languages. Objective-C for creating the UI, C/C++ for interfacing with OpenGL and GLSL for implementing the technique in the GPU’s fragment shader. The math involved in shadow mapping spans all of these languages, with different coordinate space transformations being implemented in the language appropriate to the pipeline stage we’re working on. This makes the technique a little tricky to implement the first time you attempt to. Here is another screenshot of the technique running on an actual iPad. 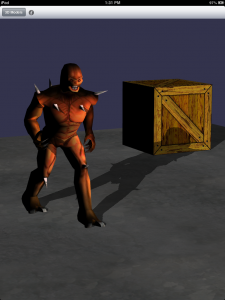 Notice how the shadow is cast on the floor as well as on top of the crate in the background. Upfront capture of the shadow mapping technique running on the iPad simulator. Shadow mapping will be coming up in the next version of the MD2 Library app.